It took 27 appearances for Andrea Pirlo to score his first goal for NYCFC, but he did it at a good time and in typical Andrea Pirlo fashion with a free kick that left the goalkeeper helpless. 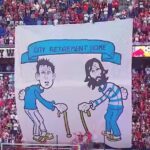 Pirlo’s free kick put NYCFC 3–0 up on Philadelphia, but proved to be vital since the visitors came back thanks to a penalty and an own goal and only lost 3–2. Earlier, Frank Lampard scored his first goal of the season in his first start of the season and David Villa added one of his own for the NYCFC superstar trifecta. Could this be the start of Patrick Vieira pulling this club together to do what’s been expected of them? We should probably get those NYCFC jokes in now while we can.